Happy Friday everyone! I know a lot of you are ready for the weekend. If you all get out, keep yourselves warm. The Arctic blast that came through Oklahoma Tuesday morning has affected most of the United States. Sweet Pea Stamps is having a “Christmas is just around the corner” blog hop. You are going to be in for a treat visiting all of Sweet Pea’s designers’ blogs. If you have come from Suzi’s blog you are on the right track. 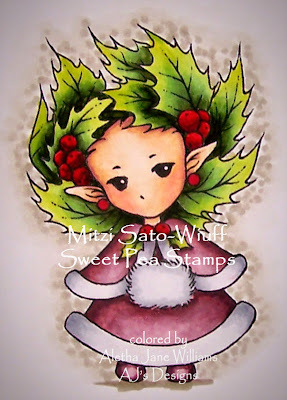 My little Christmas project is a card designed with a Mitzi Sato-Wiuff’s “Holly Sprite.” “Holly Sprite” can be found in rubber stamp form in Sweet Pea Stamps brand new website. I hope you stop by and check it out. With this new website, and if you order digital images, your digital images will be available as instant download. How cool is that? 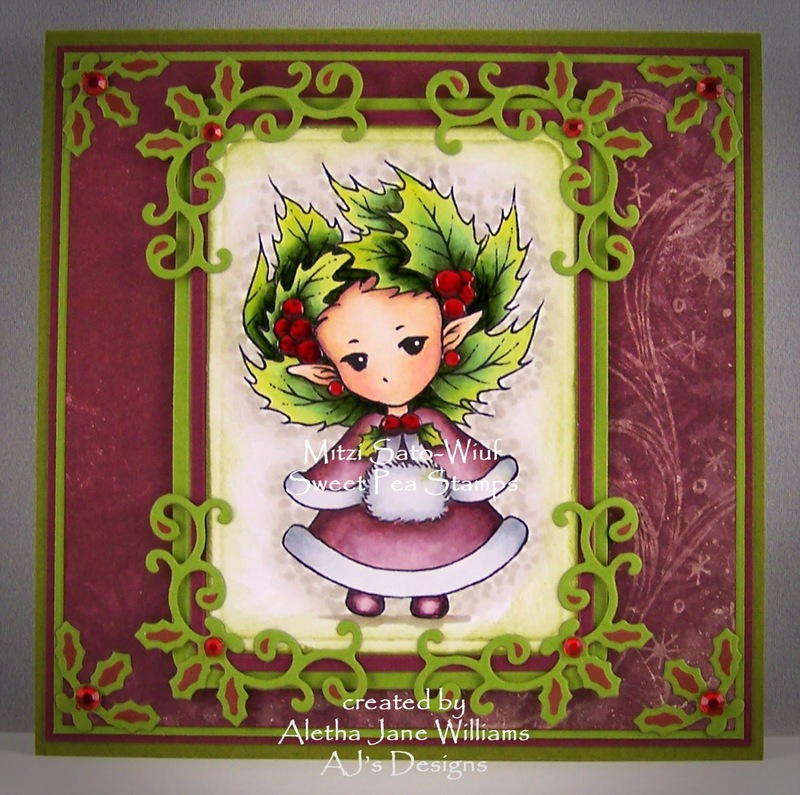 Holly Sprite was first colored with Copics and then trimmed with Spellbinder’s A2 Curved Matting dies. The next step was to add some green ink around the edges, accent the berries with Journey Glaze, and layer with burgundy and olive cardstock. The olive and burgundy cardstocks were die cut with the curved matting dies also. For corner embellishments I die cut twice the olive cardstock with Spellbinder’s Holly Motifs die, embossed with the die, and accented the embossed parts with red ink. After that was dry I cut those two apart to make the eight corner embellishments. The last embellishments were red rhinestones. Your next stop will be Olivia’s blog. Please visit each of Sweet Pea’s talented team members' blogs and leave a little love - a comment on every hop post will enter you into a drawing for a $20 gift code to the Sweet Pea Stamps store! As an added bit of fun share the hop on Facebook tagging Sweet Pea Stamps for a chance of winning a $10 gift code to the Sweet Pea Stamps store! Winners will be chosen around the first of next week. Here's a coupon for you during our "Christmas is around the corner" blog hop. Thanks for stopping by. If you have any questions, please contact me. Have fun hopping! Mornin' Aletha, I really love this beautiful little sprite. 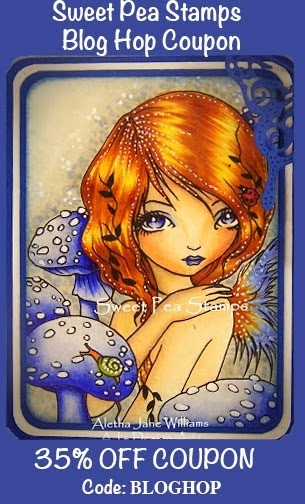 I am a fan of your colouring and this one is especially wonderful. This is gorgeous in all ways. So well painted and clean and lovely! Just stunning Aletha! You coloring is top notch. Gorgeous matching papers and die cuts. WOW. She is so sweet...thanks for giving us the Copic #'s so we can recreate your look! Such a cute card - love how you did up the frame to match!!!! So beautiful! Love the die cut bordering holly! A great blog hop for Sweet Pea stamps! Gorgeous, Aletha! Love your coloring on the Holly Sprite and the holly scrolls die-cuts to compliment the image. Just beautiful!! Beautiful coloring as usual Love the colors and those corners!